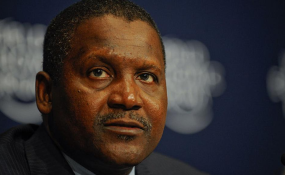 The President of the Dangote Group, Alhaji Aliko Dangote, is Africa's richest man for the eighth consecutive year, according to the 2019 Forbes Africa's Billionaires released yesterday. The industrialist's net worth was put at $10.3 billion, which was $2 billion lower than the $12.2 billion he was said to worth in last year's ranking. Dangote, according to the magazine, was closely followed on the rich list by another Nigerian - the Chairman of Globacom, Mr. Mike Adenuga, who was ranked the second richest person in the continent, with total net worth of $9.2 billion. Adenuga also owns oil exploration firm, Conoil Producing, extensive real estate holdings in Nigeria and a network of 12,000 cellphone towers. His net worth climbed dramatically from $5.3 billion in January 2018 as a result of more detailed information provided by him about his assets. Number three in Africa was diamond heir, Nicky Oppenheimer, of South Africa. His grandfather founded diamond mining firm DeBeers, which Nicky ran and then sold to mining giant Anglo American for $5.1 billion cash in 2012. He is currently worth an estimated $7.3 billion, down from $7.7 billion a year ago. Among the few on the list who are richer than a year ago was Strive Masiyiwa of Zimbabwe, worth an estimated $2.3 billion, up from $1.6 billion last year. He's richer due to a rise in the share price of Econet Wireless Zimbabwe and a new investment that boosted the value of his stake in fiber-optic and satellite-services firm Liquid Telecom. Also from Nigeria, was the Chairman of BUA Group, Abdulsamad Rabiu, who was ranked 16th, with total net worth of $1.6 billion. Folorunsho Alakija, who is the Vice Chair of Famfa Oil was ranked 19th with total net worth of $1.1 billion. Alakija owns a stake in one of the most productive oil fields in Nigeria, currently operated by Chevron. Her net worth dropped due a decline in the value of the oil field, in part because its production has levelled off. Forbes explained that: "Altogether the 20 African tycoons are worth $68.7 billion, down from $75.4 billion for last year's list. However, the average net worth for each list member this year has climbed to $3.4 billion from $3.3 billion in early 2018. "Buffeted by plunging stock prices and weaker currencies, the number of African billionaires has shrunk to just 20, down from 23 a year ago. "In a per country ranking, Egypt and South Africa are tied with five billionaires each, followed by Nigeria with four and Morocco with two. Forbes found one billionaire each from Algeria, Angola, Tanzania and Zimbabwe. The three South Africans who fell off since last year's list are Stephen Saad, founder of generics drug firm Aspen Pharmacare; Desmond Sacco, chairman of iron ore mining company Assore Group; and Christoffel Wiese, founder of retailer Pepkor and former chairman of furniture retailer Steinhoff International, which acquired Pepkor in 2015."